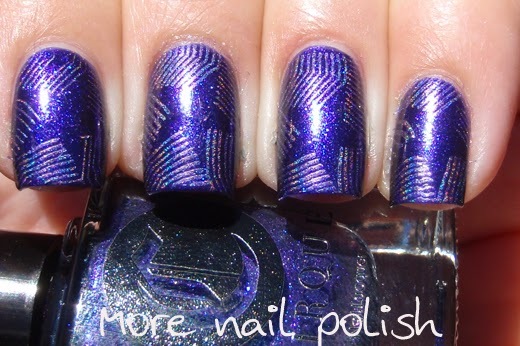 I have two gorgeous Cirque polishes from the Alchemy Colletion to show you today, both featuring some stamping from my quickly growing collection MoYou plates. First up is Baptisia, which is a strong shimmery midnight indigo. 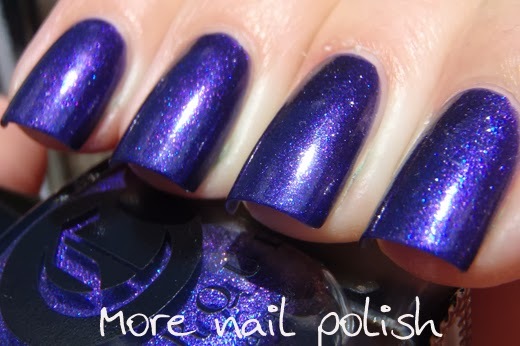 It reminds me of my favourite purple ever, Pretty Serious Poltergeist Puddle, which means this one is right up there with my favourtie colours. 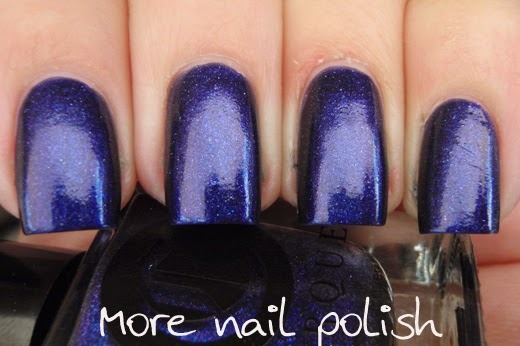 The formula is perfect and this is two easy coats shown without top coat. I love how you can see both pink and blue sparkles as well as the shimmer. I stamped the star shape formed by lines that is on Moyou Plate Back to the 70's 01. 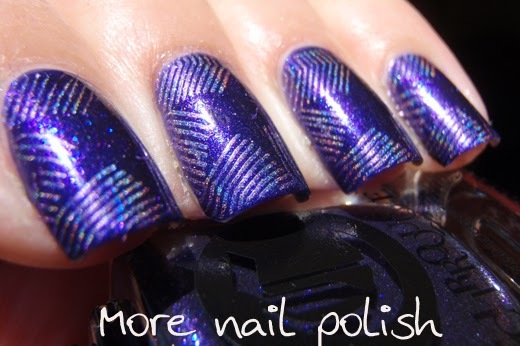 I used Color Club Eternal Beauty as my stamping polish. 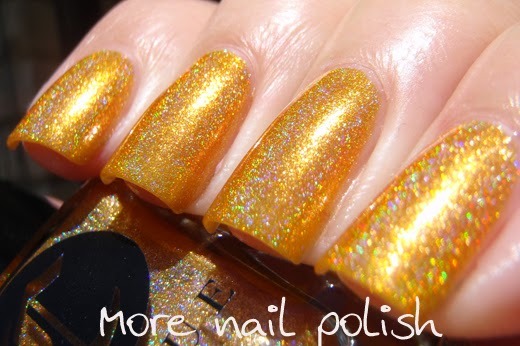 Next up the bright Chrysopoeia which is a marigold holographic polish. 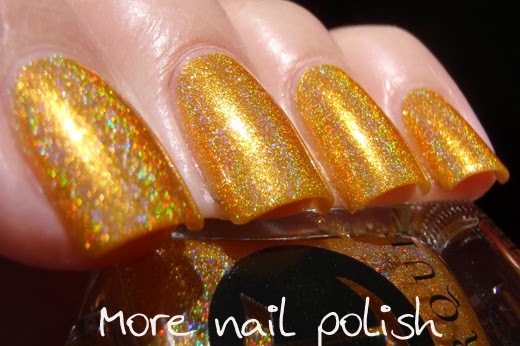 The richness of this colour is fantastic, and the formula is smooth and easy to apply. This is two coats with top coat. I actually didn't know what "Chrysopoeia" meant in relation to Alchemy, so I googled it. It turns out that it means transmutation into gold. But it was also used in the title of an alchemical textbook called Chrysopoeia of Cleopatra. 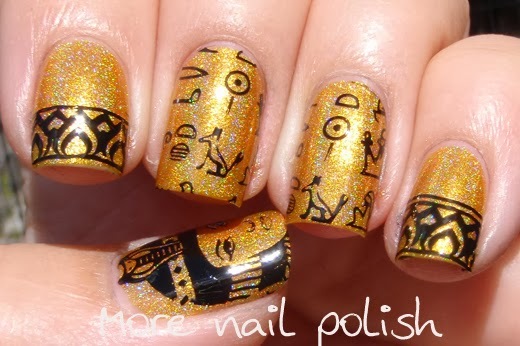 That instantly inspired me to create some Egyptian themed stamping using my MoYou plates. 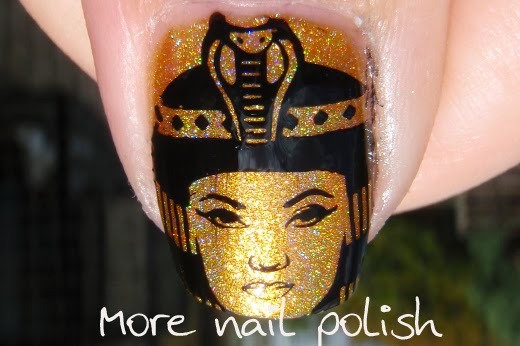 I used Artist Plate 07 for the hieroglyphs on my middle and ring finger and for the image of Cleopatra on my thumb. I used Explorer 04 to create the patterned tip. I really loved this mani, I love it when a bit of a connection can be drawn between polish names and nail art. 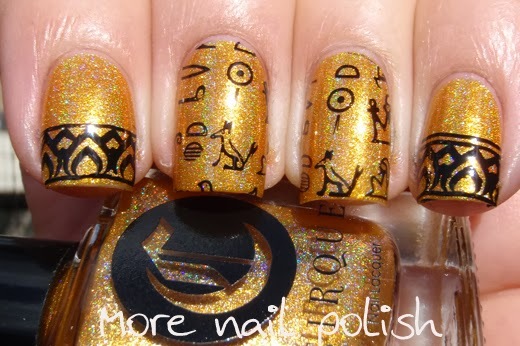 The Alchemy Collection from Cirque is available from CirqueColors.com. 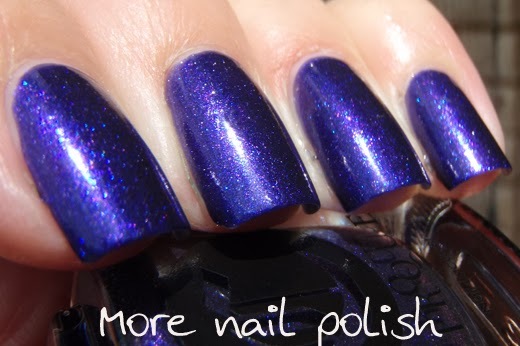 You can also find Cirque at several etailers worldwide, including Femme Fatale here in Australia. A full list of Stockists is available on the Cirque website. 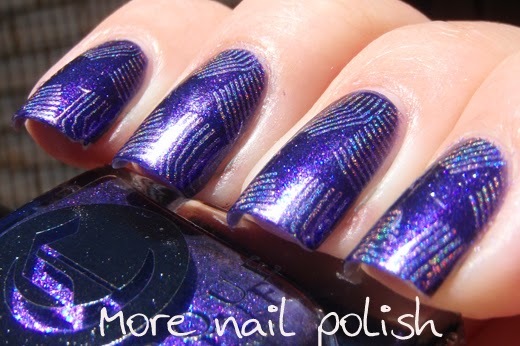 Those are some seriously pretty polishes, especially the purple. Wow! Check out this Nail Polish Remover Revolution only at 8$ !!! 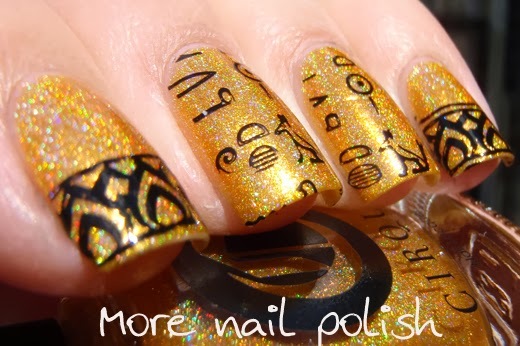 Very cool with the stamping!! Gotta get some Cirque this year, kept meaning to last year! But shame on me having bought Pretty Serious Poltergeist Puddle months ago and never using it yet!!! :O So need to do that first!! 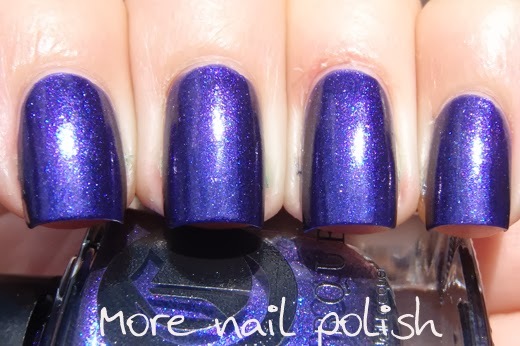 Beautiful swatching of these Cirque lovelies. 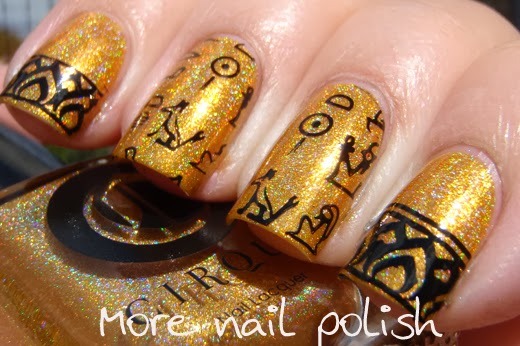 That hieroglyphic stamp is cuter than a bug's ear!